Two new illuminated art projects are now open underneath Highway 87 at Santa Clara Street and San Fernando Street. 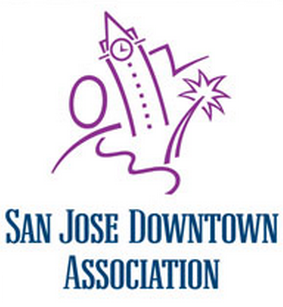 The interactive projects will make people feel safer and also bring unique artwork to the streets of San Jose. Plaza de Cesar Chavez will have a beer garden, cafe, games, interactive lighting, and music from January 29th to February 7th. Part of San Pedro Square will be closed off to create a football-themed atmosphere. Downtown Ice will have an extended season and be open daily until February 7th. Guadalupe River Run on February 7th. The NFC champion team will be staying at the Marriott Hotel. An NFL merchandise store will open at 300 S. First St.
San Jose State University will operate and manage the Hammer Theatre Center for the next three years (formerly the Rep). SJSU will produce events and rent the theater to arts groups. Events could begin this year. A new Barber's mural has been painted outside the shop at 332 E. Santa Clara Street. To read the newsletter, click here!